At our Ryde dental care clinic, we’re often asked by patients how to keep teeth healthy. Regular brushing is at the top of the list for maintaining dental health – and knowing what kind of toothbrush to use definitely helps. Let’s take a look at traditional and electric toothbrushes. • Brush-head shape. Toothbrushes are usually available in square and diamond-head shapes, with the latter designed to help clean hard-to-reach places in the mouth such as molars. • Brush-head size. Brush-head sizes typically vary from around 15mm to 25mm, with smaller sizes appropriate for very young children, and larger sizes appropriate for those 12 years and up. • Bristle patterns. Bristle patterns include block patterns, wave patterns, criss-cross patterns and polishing-cup bristles, with different patterns designed to help remove plaque, offer better bristle contact, or help clean surface stains. • Handle designs. There’s even plenty of variation in handle designs. Contra-angle brushes are designed to get to hard-to-reach spots, flexible handles aim to reduce potential injury to the gums from hard brushing, and slip-prevention handles allow a better grip while brushing. • Tongue cleaners. Tongue cleaners aim to improve freshness of breath and reduce the build-up of bacteria in the mouth. Regardless of the type of brush, it should be replaced every three to four months, or when it starts to become frayed or worn – when this occurs the toothbrush will begin to lose its effectiveness. Children’s toothbrushes often need more frequent replacing because of their softer bristles, and the additional wear that can be incurred as a result of children’s brushing habits. Electric toothbrushes can help reduce plaque and the risk of gingivitis, and can assist those who have trouble with brushing. They can also appeal to younger users. There are a number of different electric toothbrush heads available, offering unidirectional motion, rotational motion or ultrasonic motion. Electric toothbrushes vary in price, so budget may be something to consider. As with a traditional toothbrush, you’ll need to replace the head of your electric toothbrush on a regular basis. The technique involved in using an electric toothbrush is also different from using a traditional toothbrush. 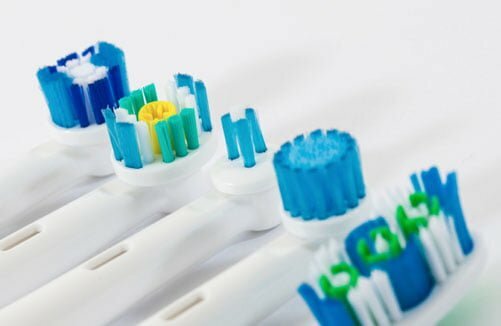 With so many toothbrushes on the market, it can be overwhelming attempting to make the right choice. Bear in mind that whichever you choose, a regular brushing routine and proper brushing technique are the key factors in keeping your smile bright and white. If you have any questions about how to maintain teeth health, don’t hesitate to get in touch – and feel free to request a brushing demonstration during your next appointment.